Limoncello is a lemon liqueur originally produced in Southern Italy. Because it's made from lemon zest (the yellow peel), not fruit, limoncello isn't sour, and goes down quite easily. Unlike many other liqueurs, limoncello is easy and inexpensive to produce, requiring only sugar, water, lemon zest, alcohol, and time to mature. It is best when served straight from the freezer. Choose thick-skinned lemons because they are easier to zest.Use 100-proof vodka, which has less flavor than a lower proof one. Also the high alcohol level will ensure that the limoncello will not turn to ice in the freezer. Wash the lemons with a vegetable brush and hot water to remove any reside of pesticides or wax; pat the lemons dry. 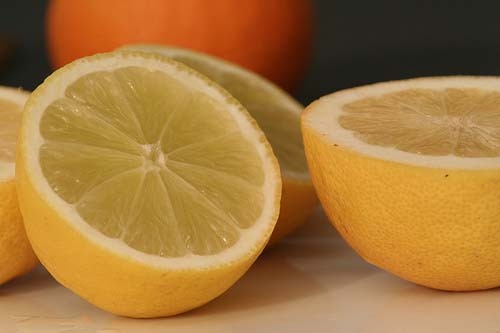 Carefully zest the lemons with a zester or vegetable peeler so there is no white pith on the peel. NOTE: Use only the outer part of the rind. The pith, the white part underneath the rind, is too bitter and would spoil your limoncello. In a large glass jar (1-gallon jar), add one bottle of vodka; add the lemon zest as it is zested. Cover the jar and let sit at room temperature for at least (10) ten days and up to (40) days in a cool dark place. The longer it rests, the better the taste will be. (There is no need to stir - all you have to do is wait.) As the limoncello sits, the vodka slowly take on the flavor and rich yellow color of the lemon zest. In a large saucepan, combine the sugar and water; cook until thickened, approximately 5 to 7 minutes. Let the syrup cool before adding it to the Limoncello mixture. Add to the Limoncello mixture from Step One. Add the additional bottle of vodka. Allow to rest for another 10 to 40 days. After the rest period, strain and bottle: discarding the lemon zest. Keep in the freezer until ready to serve. Make a simple syrup by bringing sugar and water to a boil over medium-high heat, stirring constantly to prevent scorching. When clear, remove from heat and let stand until just warm. Pour into clean 2-quart jar with tight-fitting lid. Add lemon zest, lemon juice, vodka, and food coloring. Cover and let stand in a cool, dark place for 1 month. Filter liqueur into final presentation container such as a wine bottle, fruit jar or decanter. A coffee filter placed in a funnel works great for this.